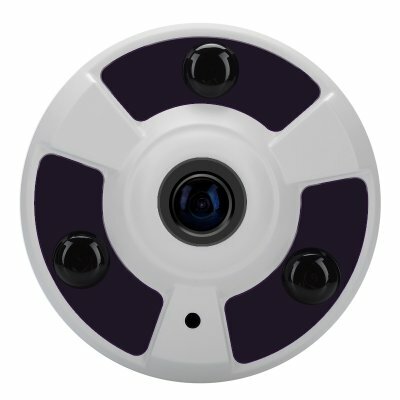 Successfully Added 2.0 Megapixel Fisheye IP Camera - 360 Degree, 25 Meter Night Vision, IR Cut, Android + iOS Support, ONVIF 2.0, H.264 Encoding to your Shopping Cart. See everything with this 2.0 megapixel Fisheye IP camera that has a 180 degree wide angle lens, support for remote viewing from your phone as well night vision and motion detection. This 2.0 megapixel fisheye IP camera can view nearly everything around it with its 360 degree lens that captures full panoramic views at full HD 1920x1080 or 1280x720. This can all be stored in a compact form thanks to the H.246 compression standards used by this camera. With mobile phone support and remote viewing apps available for Android and iOS devices you can view the camera feed on your Smartphone or tablet and this fisheye camera supports all the major internet protocols. This means that you don’t need to be on the premises to keep an eye on what is happening and brings you the freedom to check up on your property remotely so you get peace of mind no wherever you are. When the lights go out this camera is still effective as it has night vision and can record in color even with just 0.3Lux of light or switch to Black and White for recording in 0Lux conditions where it has an effective range of 25 meters. The motion detection can be set up to alert you to any unusual activities and send an e-mail alert if it’s triggered. Compatible with most major security systems this ONVIF 2.0 complaint security camera can operate across a wide range of temperatures and conditions to keep you and your valuables safe. Remote View: IE browser, Cloud service platform, Smart phone apps.